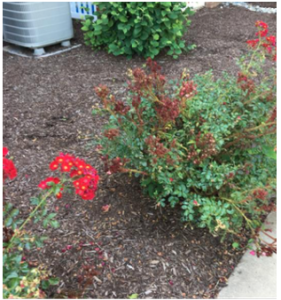 You are here: Angels Landscape and Suburban Sidewalks > Blog > Landscape Maintenance > How Do Your Roses Look? Is Rose Rosette starting to strike in your area? Rosette is starting to strike in the New Jersey area. If you have knock out roses in your landscape you must be on the lookout for the signs of this disease and treat them immediately to reduce the risk of spreading. Here are some suggested tips on how to manage this disease. and destroyed by burning or placing in a plastic bag. Care must be taken when working with diseased plants as you can facilitate spread of the mites that spreads the disease. Bag the plant before removal, cut it at ground level and then dig out the plant’s roots. Soil need not be removed. Clean tools and put on fresh clothing before moving to a disease-free plant or area.